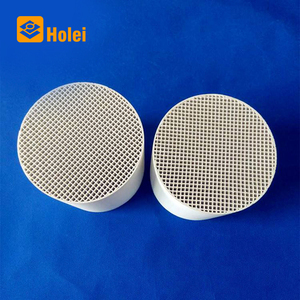 1 YRS Shenzhen Holei Technology Co., Ltd.
2 YRS Beihai Dream-Top Environmental Protection Technology Co., Ltd.
1 YRS Gongyi Hongda Furnace Charge Co., Ltd.
We can provide honeycomb ceramic substrate has been coated and non-coated precious-metal. 3. Except the size we have now , We also can produce special size as u need. Our service at promise: 1.We promise to reply your inquiry relational our product within 24hours. 2 YRS Rewell Refractory Zhengzhou Co., Ltd.
10 YRS Sinic Brilliance Machinery (Luoyang) Co., Ltd.
11 YRS Pingxiang Central Sourcing Ceramic Co., Ltd.
3 YRS Guangzhou Chemxin Environmental Material Co., Ltd. The cells density can be 100 cpsi, 300 cpsi ,400 cpsi or 600 cpsi. We can supply both ceramic element coated with noble metals of Pt, Pd, Rh and ceramic element without noble metals. Na2O Fe2O3 other 31-34 48-51 12-14 &lt;1 &lt;0.5 &lt;1 Specific heat20-100&deg;C J/KG. 6 YRS Tianhua Institute Of Chemical Machinery And Automation Co., Ltd. 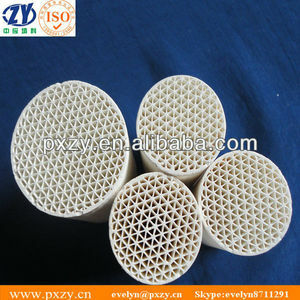 Ceramic honeycomb materials exist mainly as the support of catalyst, heat exchange media and filtrate substrate. RICM primarily produces such the ceramic honeycomb material as the support of catalyst and heat exchange media. 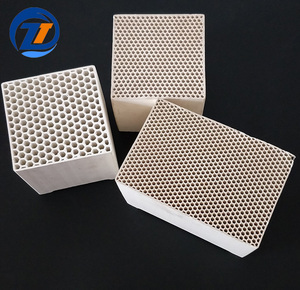 Ceramic Honeycombs as heat exchange media (for RTO) Honeycomb ceramics are a new kind of industrial ceramic product developed in recent years. 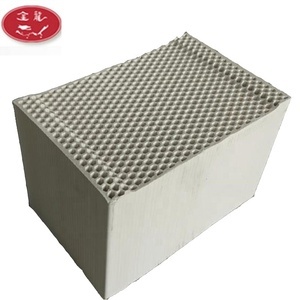 2 YRS Pingxiang Bestn Chemical Packing Co., Ltd.
Honeycomb Ceramic Regenerator Heat accumulation for Heat Exchanger H oneycomb ceramic is is widely used in heat transfer, storage , waste gas purification and catalyst carrier for RTO, RCO plants . Material: Alumina , Mullite, Cordierite Package: Wooden case. Delivery Time: About7 days since payment receipt. Currently the materials for products mainly are cordierite, mullite, alumina, corundum and corundum mullite. Size: 100&times;100&times;100 mm, 100&times;150&times;150 mm, 150&times;150&times;150 mm, 150&times;150&times;300mm and others. 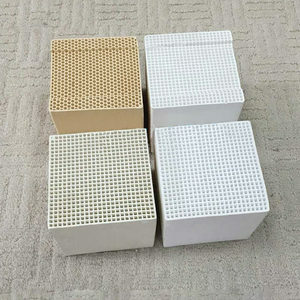 Quantity of hole: 25&times;25, 32&times;32, 40&times;40, 43&times;43, 50&times;50, 60&times;60 and others. 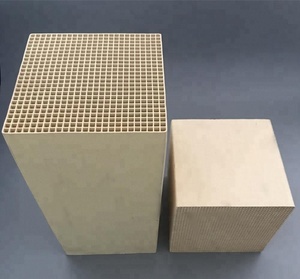 Mullite Honeycomb Ceramic Regenerator for Regenerative Thermal Oxidizer Honeycomb ceramics are a new kind of industrial ceramic product developed in recent years. 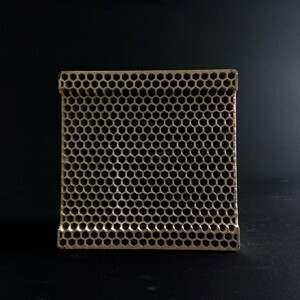 At present, ceramic honey -combs are being used to purify industrial waste gas, automobile emissions, eliminate noise, deal with waste water, to dry air, incineration, used in the manufacture of infrared ray instruments, to filter metal liquids etc. At present, our products have already been approved by numerous iron and steel enterprise and exported to Japan, South Korea and Europe and America market. 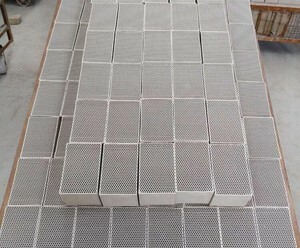 Compared with the electrical drying stove and common gas-fired combustion stove, infrared honeycomb ceramic plates have the following advantages: 1.Save 20-50% energy consumption. It increases the specific surface area through transforming the simple plane surface into intersectant corrugated solid surface. By this way, it can promote the combustion supporting function and achieve the goal of energy conserving and environment protection. 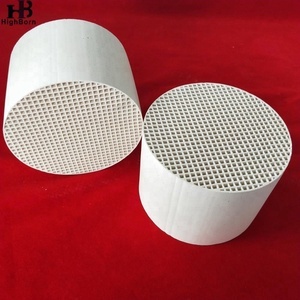 2.Q:What's your main products9 A:We are making Honeycomb ceramic, Ceramic foam filter and porcelain insulator and export to overseas for many years. 3.Q:How can you control your quality9 A:For each production processing, we have complete QC system for the chemical composition and Physical properties. 7.Q:Can we visit your company9 A:Yes, for sure, you are welcome to visit our For other details,please contact with us directly : Free E-catalog & Price list will be sent within 24 hours!!!!!! The pores of the Honeycomb ceramic regenerators are square and hexagonal, and the channels of pores are straight and parallel to each other. All of our engineer has been engaged in refractory material industry for more than 20 years. In the technological team there are more than 10 senior designers and engineers,more than 20 technicians. Alibaba.com offers 2,047 heat regenerator products. About 17% of these are ceramics, 14% are machine oil purifier, and 1% are other beauty & personal care products. A wide variety of heat regenerator options are available to you, such as free samples, paid samples. There are 2,047 heat regenerator suppliers, mainly located in Asia. The top supplying country is China (Mainland), which supply 100% of heat regenerator respectively. Heat regenerator products are most popular in Domestic Market, North America, and Southeast Asia. You can ensure product safety by selecting from certified suppliers, including 620 with ISO9001, 458 with Other, and 287 with ISO14001 certification.